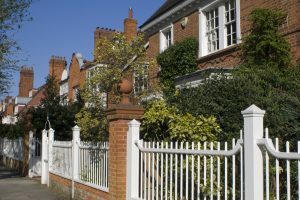 Founded in 1963 to protect the character of the garden suburb, the Bedford Park Society was first set up when a local conservationist, Architect Tom Greeves, and community activist Harry Taylor met. They had both had expressed horror at a rash of demolition and inappropriate development in the neighbourhood and decided to act after a large Norman Shaw house in Bedford Road was replaced by a yellow-brick, flat-roofed old people’s home – the antithesis of the suburb’s steep roofs, red tiles and gables. Tom, who with his wife Eleanor went to live in Newton Grove in 1951 and stayed there till his death, came to be known as the saviour of Bedford Park. An architect, a witty perspectivist and an able musician, Tom had the breadth of culture to appreciate both the charm and the originality of the place when few others did, and worked indefatigably on its behalf. He realised that the only real protection for Bedford Park lay in statutory listing of the buildings. Seeking advice, he turned to poet John Betjeman, a prominent defender of Victorian architecture. Betjeman – who became the Society’s first patron – suggested they print some headed paper and start lobbying as if the Society already existed. Tom became secretary while Harry was vice-chairman until his death in 1964. The turning point was the 1967 Bedford Park Festival, when the Society organised an exhibition in the vicarage to highlight the history of Bedford Park and the dangers it faced. One visitor was a Ministry of Housing & Local Government inspector, who was so impressed he recommended the Grade II listing of 356 buildings, including the former Stores (now offices), the Tabard Inn, the Club (now the London Buddhist Vihara), the Church of St Michael and All Angels and its Parish Hall. The Church and Tabard have since been promoted to Grade II*. This victory was consolidated when Conservation Areas were declared by the boroughs of Ealing (1969) and Hounslow (1970), who administer the two halves of Bedford Park. These areas have since been expanded to take in more non-listed houses. In 2001 Hounslow implemented an Article 4(2) Direction, which gives greater protection to these non-listed buildings. Ealing Council introduced an Article 4(2) Direction in 2008. The Society is interested in the buildings, their setting and their maintenance, along with encouraging development sympathetic to their architectural and historic importance. We want owners to appreciate details such as windows, brickwork, boundary fences and mature trees which all contribute to the character of our streets. In addition to our core preservation work, we are also concerned with a broad range of issues that affect Bedford Park and are keen to respond to our members’ interests and requests for help with local issues. We are committed to modernising and improving the effectiveness of the Society’s communications and our contact with our members. We have an established programme of events including meetings, lectures, exhibitions and social activities. The Society has links with similar organisations locally and combines resources and ideas with them to tackle local issues. We are also a member of the London Forum of Amenity Groups, a capital-wide organisation chaired by the Society’s vice chairman, Peter Eversden. Recently, the Bedford Park Community Group joined forces with the Society, enabling us to provide a single, more powerful voice for Bedford Park and the whole community. This follows a Special General Meeting of the Bedford Park Community Group on 27 February when the formalities were completed to dissolve the association. While continuing to maintain the Society’s core work to protect and enhance the amenities and architectural quality of the area, the fresh support and perspective from the Bedford Park Community Group has increased our capacity to tackle a broad range of issues more effectively and to implement our plans to modernise and improve the way we work. We are most grateful to those members of the Bedford Park Community Group’s Management Committee and their Road Representatives who are now working with the Society and for the contribution they have already made. We believe that we are now able to better serve the needs of our members and those of the whole local community.